Woodland Lake Park may be the ideal outdoor area for the entire family. Facilities include tennis courts, softball fields, spacious picnic shelters and public restrooms. Birdwatchers will find a number of species of water fowl around Woodland Lake, as well as other species in the surrounding woodlands. 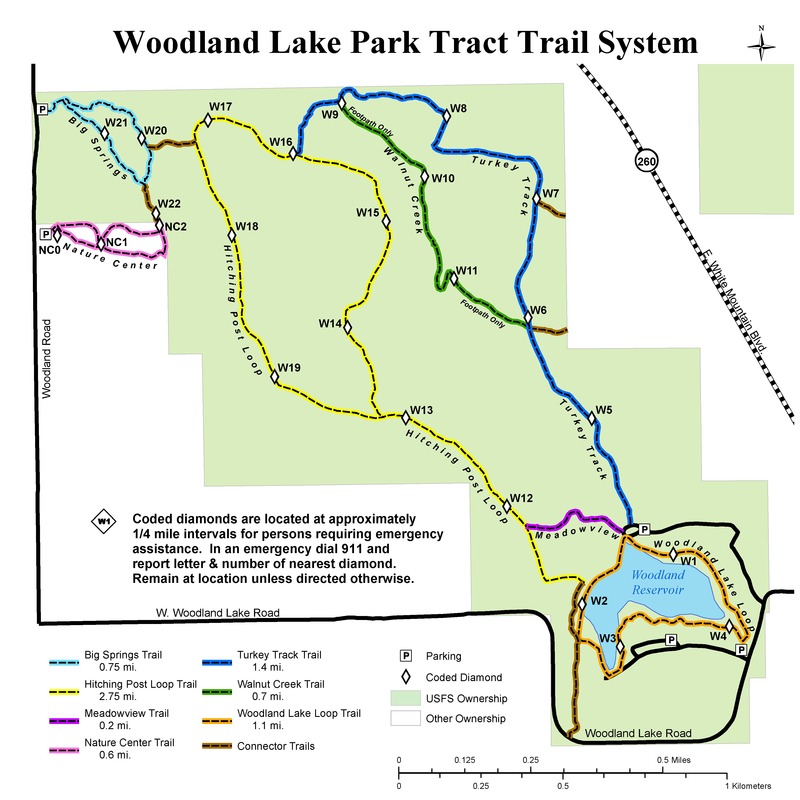 There are several short, interconnected trails at Woodland Lake Park. The 1.25 mile Lake Loop Trail is level and paved. From there, one can take a side trail to the Hitching Post Loop Trail (2 miles) or a walk to Big Springs Environmental Study Area. Walnut Creek Trail was first developed in 1967 as the beginning of the Lakeside District's visitor information program. It gets its name from several small springs bubbling from the east side of the creek and the black walnut trees that are part of a favorite habitat of birds and squirrels. The nature trail, once clearly established, is not as well defined today as when it was being used regularly on guided tours. Some horse trails are more clearly marked. Don't be confused, but follow the old trail until it turns left into the creek. Then follow the path down stream to the old bridge. The path leaves the canyon at this point and leads back to the point of beginning.